Grow Room Masters - Professional Cannabis Grow Room Consultation , Planning and Building Services. Our Grow Rooms produce 2.5-3.5 lbs per light! Grow Room Masters provides professional Cannabis Growing Consultation , Planning , Designing Building and Growing technics in both indoor & outdoor Cannabis Cultivation. We offer Turn key operations for large or small Cannabis grow rooms from start to finish. Fully automated systems are offered on request. We offer 1 hour free consultation with no obligation call today. One of the biggest challenges that growing marijuana poses is the risk of one's plants acquiring certain devastating diseases and deficiencies. Forms of cannabis maladies can include contamination of the leaves with bacteria, fungi, pests, and vitamin deficiencies. It is crucial for the grower to quickly identify the exact cause of unhealthy plants and focus on treating it immediately to reduce the risk of the plants dying. Spider mites, a tiny species of the Arachnid family, are an extremely common type of marijuana pest. However, their high prevalence in grow rooms and greenhouses does not mean they shouldn't be taken seriously. In fact, spider mites can be nearly impossible to exterminate if they are not identified very early on. This is due to the fact that spider mites can infest an entire population of plants rapidly, but are difficult to spot because of their diminutive size. Mold, also commonly known as “bud rot”, is another common affliction among marijuana plants. One type of fungus that is known to very commonly affect cannabis is powdery mildew. Powdery mildew seems to favor budding marijuana plants, but can also be found on the leaves alone. Spores of this type of fungus generally are found in the air near affected plants, so those growing marijuana plants indoors need to ensure that they have a reliable ventilation system in order to avoid powdery mildew. Likely one of the most easily treatable causes of unhealthy marijuana plants is vitamin and mineral deficiency. Many cases of unattractive leaf spotting, yellowing of the cannabis leaves, or sagging of the entire marijuana plant can be corrected simply by adding a broad-spectrum mineral and vitamin supplement to the soil or water. However, occasionally these sickly plants are lacking in one particular vitamin. Therefore, they will need a supplement to meet that specific deficiency. 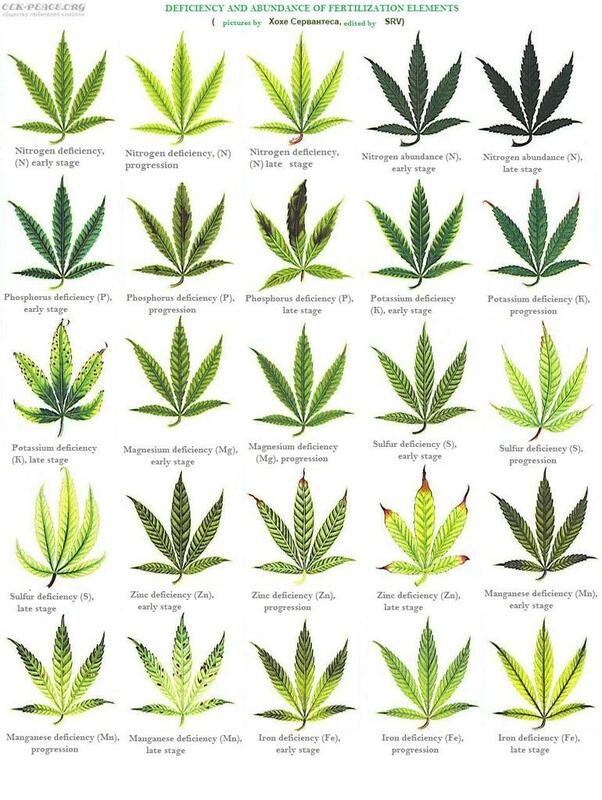 Very common specific nutrient deficiencies in marijuana plants include boron, calcium, iron, nitrogen, and copper. If one thing is for certain, thorough research on the vast array of potential marijuana leaf diseases and their treatments can lead to the cultivation of strong, flourishing, and beautiful cannabis plants. Different strains of marijuana yield different quantities of the final useable product. There are two primary types of marijuana strains, known as indica and sativa. In order to understand the different average yields, you must know the difference between the two varieties. 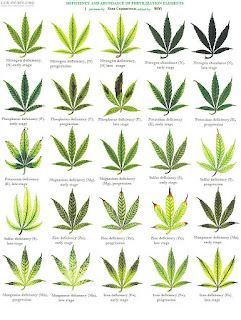 The easiest way to classify whether a strain of marijuana is an indica or sativa is through the shape of the leaves. Indica strains are known for their wide, short leaves, while sativa strains are better recognized by their long, thin leaves. Sativa plants are better suited for outdoor growth, and some have been known to reach heights of 20 feet. Indica plants are generally shorter and denser, so they're best grown indoors. Each provides slightly different effects, as well. Sativa strains provide an energetic boost, while maintaining a cerebral high. Indica strains, however, are meant for relaxation, and are best enjoyed on the couch after a long day. Another factor that can be used to further identify an indica or sativa strain is the yield. Indica strains generally produce higher yields, but there are exceptions to that rule. Many of the original indica strains, like OG Kush, produced smaller quantities of highly potent cannabis, but cross breeding has created a new generation of hybrid plants that have some of the best characteristics of both strain varieties. Some of the highest yielding strains today are Dragon's Breath and Blue Dreams, both of which are sativa dominant. Other strains that produce high yields include Hawaiian Snow, Mazar, and Tangerine Kush. 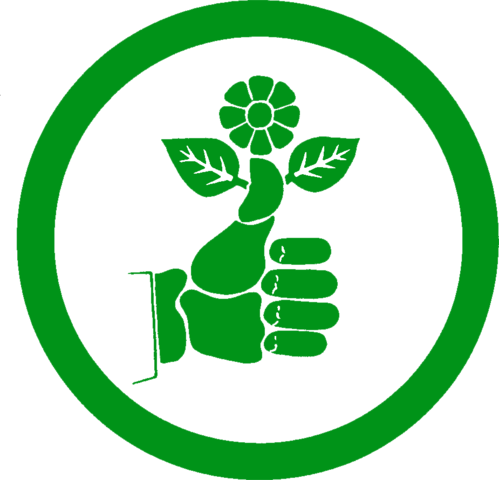 Hydroponics is a process of growing plants with nutrients in water. There is no soil used. 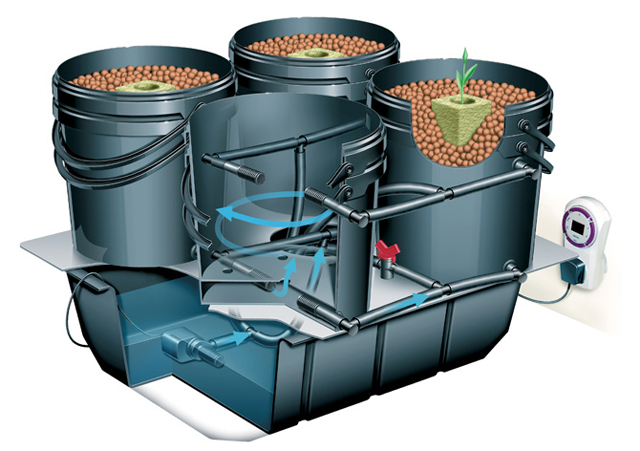 There are several types of hydroponics growing systems. The Ebb and Flow System works by flooding the plant roots with liquid nutrients and letting them drain back out of the tray. This is done several times a day. The Top Drip System is the most popular type of hydroponic process. This involves a steady drip of nutrients onto the plants. The solution can be drained into a container and reused, or it can be discarded. The Wick System is very simple. Wicks deliver nutrients into the tray to be available for plant roots. This system uses no motorized processes. A Water Culture System is one that has the plants on a floating platform in nutrient solution with the roots exposed to the liquid. An air pump releases oxygen into the water. The Nutrient Film Technique is one that has a continuous flow of liquid nutrients over the plant roots. The tray is slightly tilted to let the solution run across the roots. An Aeroponic System is one that has the plants suspended in the air. The roots of the plants are misted at regular intervals with the nutrient soil. 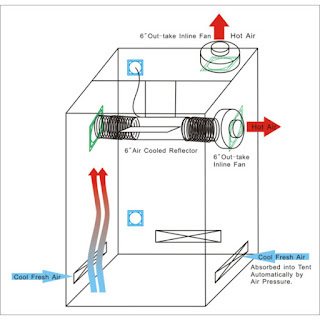 Ventilating an indoor grown room is critical if you want the most profitable grow season possible. Ventilation systems not only keep the plants from reaching unsafe temperatures, but they also circulate air, which provides your plants with the much needed carbon dioxide they might otherwise use up in a stagnant environment. 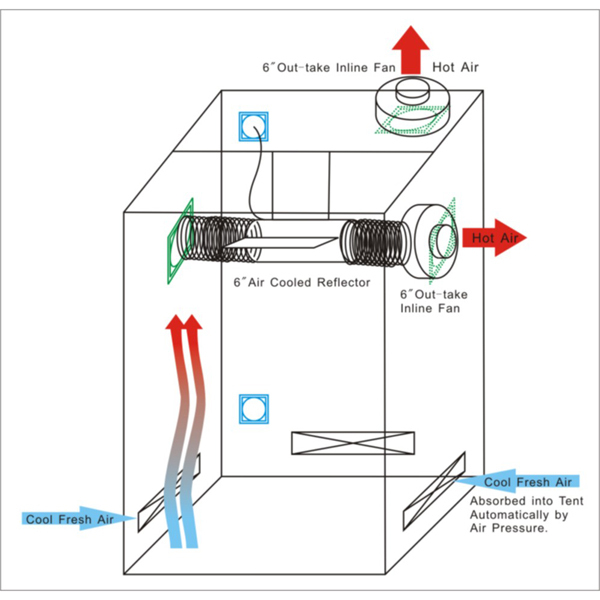 The right ventilation system will save you hundreds on lost product, and it can quickly pay for itself. Grows rooms should never go above 95 degrees Fahrenheit. It is recommended that they be kept far lower, in the range of 75 to 85 degrees F. A proper ventilation system will make use of an extractor fan to pump warm air out of the grow room and an air pump that will refill the room with cool air. The amount of circulation you need will be based on the size of your grow room, the intensity of your lighting system, and the number of plants in the room. Ventilation in and out of the room is vital, but something often overlooked in the process is the air movement inside the room. Oscillating fans should be used to keep the air moving in the room itself, so the cool air reaches each plant. Standard floor fans are ideal for this purpose. Another important step in the ventilation process is CO2 injection. It's not only important that the air in your grow room stays at the right temperature, but it must also have the proper concentration of carbon dioxide. Too little carbon dioxide can be detrimental to plant growth. CO2 injection works by adding carbon dioxide to the ventilation system, perfectly simulating the ideal growth conditions. A dehumidifier should be used in your grow room as well. Excessive moisture can ruin plants, and it could potentially harbor mold, mildew, and other undesirable issues. All these factors play a huge part on the overall yield of your grow room.